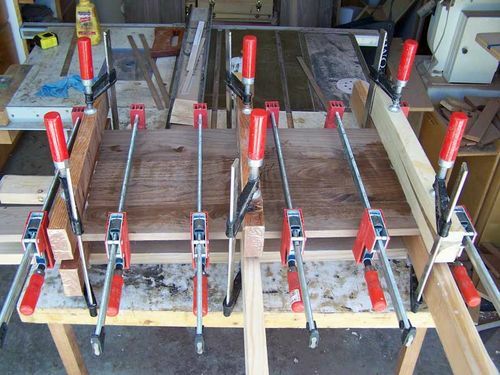 Clamping cauls are superior to dowels and biscuits for aligning panel glue ups. No, they don’t align the ends of the boards, but biscuits have too much play to do so, and have too much play to align the board edges. Dowels will align the ends, but you need one every 10-12 inches to get the edges to align, and good luck hammering all your pieces together. Various router bit profiles can align the board edges, provided you set the bit exactly right, but provide no end alignment. Granted, you have to buy or make clamping cauls, but they are easy to make and you will have them ready. Once made, they are much easier and quicker to use than the other methods listed. Cauls can also be used to clamp plywood edge banding, shelves into case work, anywhere you need even clamping over a distance. The picture below is an example of using them for panel glue ups. Cauls can be made out of any wood any size. For simplicity, we will deal with standard construction lumber grade Douglas fir 2×4 studs here. It’s cheap, readily available, and almost as strong as oak in bending. Select the best you can find – straight grain no knots preferred. I find a 36” length makes for a good general size. It will work for panels up to 36” wide without alignment dowels, and ~32” with alignment dowels, just depending on where you put the dowels (located at each end of the bottom caul – see below). First I’ll discus design elements, then the process. The inside surfaces (that touch wood) need to be radiused so that force is applied from the center out to the edge of the panel. This force keeps the boards across the panel aligned. Plastic packing tape is applied to these surfaces and waxed to prevent glue sticking. One F style clamp is placed on top and bottom of the cauls at each edge of the panel being glued (not the end of the cauls which would cause the center to actually lift when tightened). The alignment dowels at each end simply keep the cauls aligned while tightening the clamps. Trying to keep them aligned by hand while clamping is not as easy as you might think. The “feet” on the bottom caul lift the caul off the work surface so the F clamp can be easily put in place without having to lift the caul and panel. I just screw them to the bottom and they can pivot to align with the caul for storage. Now for the process to make them. I rip pieces down to ~ 1-1/2” wide on the Table saw. The width of the piece becomes the vertical “thickness” of the caul. I find that with 1-1/2” thick fir, this width provides the right amount of stiffness to provide the right amount of clamping across the panel. 2” wide material required too much clamp force to bring the edges together, and thinner pieces didn’t provide enough clamp across the piece. The ripped surfaces become the top and bottom of each caul. I plane or joint or hand plane all surfaces to get them somewhat flat. The surfaces that will touch wood should be as flat and straight as you can get them. Next is creating the radius. I found a lot of interesting, complicated methods to do this while contemplating how I wanted to do it. This is a very simple method using a machine or hand plane. Refer to the drawing below. In the center of the top caul, counter bore a hole part way through. Then drill a pilot hole for the screw size (I use a #8) all the way through both top and bottom pieces. Now drill a screw thread clearance hole in the top piece, from the counter bore through the board. Refer to the picture below. Spacers are placed between the boards at each end. Depending on the length of the cauls, the spacers vary to provide the right amount of radius. The screw is put through the counterbore in the top piece and then screwed into the lower piece and tightened until the boards touch in the center (the clamp in the picture represents the screw). The curved outside surfaces are now planed down to be flat and parallel. Back to the screw – the screw length and counterbore depth are selected such that when the screw has collapsed the gap, the screw tip does not protrude to screw up whatever planing method you choose. Use a clamp to help the screw pull the pieces together. I use a hand plane to flatten the curve, starting at the center of each board, and alternating direction every few passes, and finish with a few light passes the length of the board. Remove the screw, and you now have perfectly curved radii on each board. The holes for the alignment dowels and clearance holes in the other caul can be drilled at any time, but wait to insert the dowels until now. I make the dowels a slip fit and put a screw through the side to hold them in place. The dowels can be removed for clamping long surfaces, and just in case a dowel breaks it is easy to replace. This could be done a couple of ways on a jointer. One is using a screw and spacers as described above, alternately passing each end over the cutter until the surface is flat. The other method doesn’t use a screw. For each board, start with the center of the board at the cutter, making passes until the appropriate amount of material is removed at each end of the board. I haven’t tried either method so perhaps someone can comment on the things to watch out for. I’m sure there is a way to do it with a planer, but I didn’t bother figuring out how to keep it from flopping over. I like to radius all edges with a round over bit in a router. The feet can also be added to the caul with the dowels. I lightly sand all surfaces and give them a couple of shellac sealing coats. The packing tape is put on the curved surface, and all surfaces get a coat of wax to prevent glue sticking. The packing tape can be replaced anytime glue builds up. Very nice. Clever idea for making the curved edge. Correct, both of the outside boards, when screwed together and spacers at each end, get flattened. When the screw is released, the surfaces are then curved, and are the surfaces placed against the wood to be clamped. I need to makes some of these, as I always struggle with panel glue ups. Quick question: do you clamp the cauls first, then clamp the panel? The wax to prevent sticking doesn’t cause any problems with finishing?? The panel will still need to be prepped – glue removal, sanding, planing, etc. so if any does transfer it gets removed. thanks I figured as much but a wipe down with mineral spirits or something to get rid of the wax isn’t a necessary step. I use oak cauls 2.5” square. Mine are only bowed by 1/16” or so, and they work fine too. As long as the center of the panel gets pressure before the outside of the panel, they seem to work fine. I use them for all panel glueups, and agree with you that cauls are the way to go. Nice. This is brilliant in it’s simplicity. I’ve got my first really long dining table top build coming up and just happening across this might have made the difference between maybe getting lucky and being sure to get it right.